Empty raspberries into a colander, rinse and pick out any that are bruised. Add raspberries, maple syrup and lemon juice to a small sauce pan and bring to a boil. Cook, stirring continuously and skimming foam from the surface for 5-12 minutes or until the mixture reaches 225 degrees F on a candy/instant thermometer. To test if its ready, remove the jam from heat, and spoon a small amount onto a plate. Transfer plate to the freezer for 3 minutes. If the jam starts to gel, it’s ready. If not, continue to cook for a few more minutes and retest. 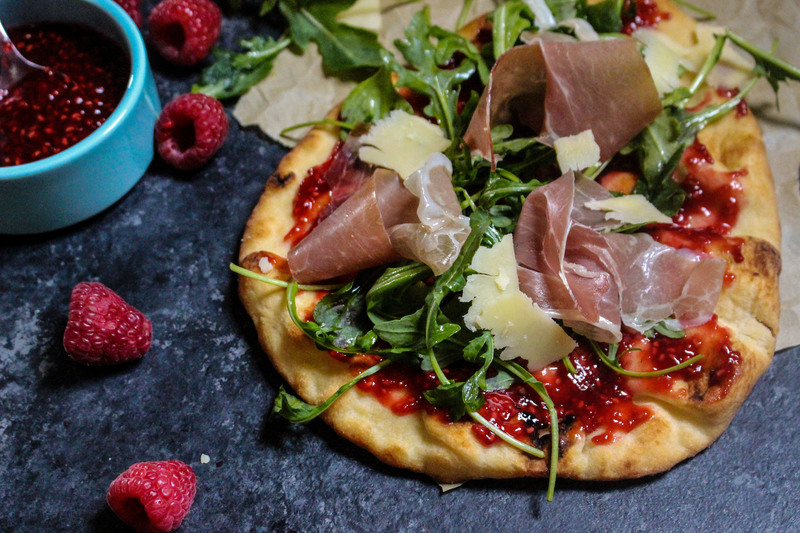 While the jam cools, heat flatbread in preheated oven by placing them directly onto the oven rack for 5-7 minutes. To assemble the flatbreads, add 2 tablespoons of jam on each and spread evenly. Then toss arugula with avocado oil and add on top. Finish with a couple slices of prosciutto and shaved cheddar on each flatbread. Enjoy with a nice glass of Rosé. Leftover jam can be stored in a sterilized mason jar with an air tight seal. Enjoy with toast, crackers or on a cheese plate.